‘Committed to truth, compelled to justice’ is the guiding principle for the rule of conduct and direction of all ministries whether it be an individual ministry of a sister or community project or corporate (501(c)(3) sponsored ministry. Through the years, the Sisters have founded and sponsored dozens of ministries, filling a variety of needs in the community. Many were made self-sufficient and passed on to be ministered by the lay community. Others ended as need diminished or objectives were achieved. Today, the Racine Dominicans have six sponsored ministries blessed with the assistance of thousands of professionals, volunteers and donors (individual and corporate), religious and lay people whose missions align with the Racine Dominicans. These sponsored ministries are: Bethany (aka. Catherine Marian Housing), Eco-Justice Center, HOPES Center of Racine, St. Catherine's School, Senior Companion Program, and Siena Retreat Center. Read on to get an overview of these special organizations. Bethany Apartments provides transitional housing for women and children who have suffered domestic abuse. All of Bethany’s residents are homeless and low income. Our mission is to provide safe, decent, affordable housing to women and children; to provide supportive services that enable participants to regain their self-esteem and develop the skills needed to live independent lives; and to strive to enable the women and children to create an environment of nonviolence in their relationships and in their families. Dedicated to environmental education and care of Earth, our Eco-Justice Center demonstrates sustainable, simple living in the context of community, contemplation, creativity, and cultivation. The center includes wetland, woodland, pasture, gardens, outbuildings, an “Education Station,” and a residence for the community of sisters who live and work at the Eco-Justice Center. Youth and adults experience hands-on learning in day camps, field trips, education programs, workshops and volunteer activities. Organic gardening, raising various animals and caring for alpacas are some ways those at the Eco-Justice Center live in harmony with Earth. Visitors have the opportunity to touch the natural world and develop a deeper appreciation and respect for our Earth’s precious resources. Located in the heart of downtown Racine, HOPES Center is a collaborative, multi-dimensional organization designed to promote awareness and offer solutions to the causes and consequences of poverty, mental illness and social injustice. HOPES offers counseling, case management and healing arts services to Racine’s homeless and mentally ill free of charge. As a recently state certified Outpatient Mental Health facility, they will now be able to offer services to the underinsured and those on Medicare or Medicaid. HOPES Center relies heavily on community support through donations and volunteerism. HOPES is an acronym for Healing, Opportunity, Peace, Ecology and Spirituality. Our program strives to alleviate the loneliness of elderly men and women in Racine County by providing companionship and linking them with their church and other community resources. Our goal is to enable seniors to live out their later years with hope, meaning and dignity by matching volunteer visitors with older adults who are homebound or in living facilities. Located on the scenic shore of Lake Michigan, our Retreat Center offers a variety of retreats and enrichment programs in a serene, nurturing environment. In addition, we offer spiritual direction and training, private time away, directed retreats, and an extensive, contemporary bookstore. We have both an indoor and an outdoor labyrinth. The Retreat Center also hosts the gatherings and retreats of other organizations and groups focused on spiritual wholeness. Environmental education. Care of Earth. Anti-poverty awareness. Solutions to causes and consequences of poverty. Healing and wholeness. Alleviate loneliness and isolation of homebound adults. Read Dominican Roots published through the Racine Dominican sponsorship office. 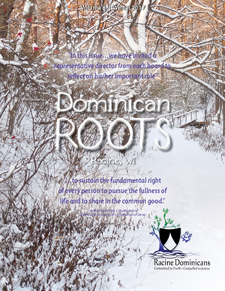 Dominican Roots features stories, news, progress and insights of the Racine Dominican sponsored ministries.